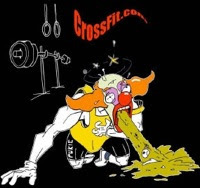 21:37--, 20# thrusters and knees to chest. I'm glad I wasn't working out by myself b/c I would've given up after the 2nd round. I modified from toes to bar to knees to chest...there was nooo way I was going to be able to do 75 toes to bar without tearing the crap out of my hands,not allowing me to finish, plus I'm pretty sure my core isn't strong enough to that many.Today was brutal.